The Dallas Art Fair will open a permanent cultural space in the city’s Design District. The Dallas Art Fair began as a fairly regional expo with 35 exhibitors, but it’s become an important and decidedly international affair, with nearly 100 galleries participating in its tenth edition in 2018. In April 2019, it will welcome three powerhouse London galleries exhibiting for the first time: Lisson Gallery, Sadie Coles HQ, and Blain | Southern. And now the fair will plant a permanent flag in its hometown, opening a cultural space in the Design District called 214 Projects that will have year-round programming to supplement the fair’s offerings each spring. 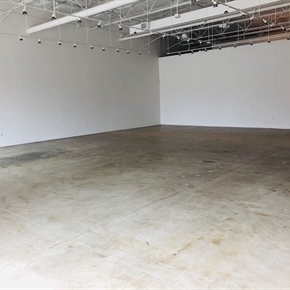 Spanning 2,500 square feet and run by Dallas Art Fair director Kelly Cornell, 214 Projects will open March 2nd with “Emmanuel Van der Auwera: White Noise,” which is supported by Belgian gallery Harlan Levey Projects, a longtime exhibitor at the fair. The fair’s new space will be a part of a redevelopment fronted by fair chairman John Sughrue called River Bend, a community within the Design District that also boasts the celebrated local outfit AND NOW, and will soon be home to Erin Cluley Gallery. Institutions such as the Goss-Michael Foundation and Dallas Contemporary are a short drive away. In a statement, Cornell said: Dallas is a city with a rich cultural landscape. Our exhibitors and their artists can now become a much bigger part of it. Directing this space will strengthen our relationships with them and give them the platform to connect with the city on a deeper level. The exterior of 214 Projects will feature tile murals by Clare Woods, an English artist who will have a solo booth with Simon Lee Gallery at this year’s fair, which runs April 11th to 14th. The plan is to have international galleries provide programming for the space all year. Once operational, 214 Projects could provide a template for how other fairs throughout the U.S.—ones with deep rosters of passionate, active collectors who look forward to buying work from galleries around the world at the fair each year—can maintain transatlantic ties in the months between their annual fair.